Matra was more than just a car company. In addition to automobiles, they built missiles, computers, boats, and satellites. Their first car was the Djet, an evolution of the earlier Rene Bonnet Djet. New for 1967, the 530 series was their next automotive endeavor. If you’ve never seen one of these in person, they are quite striking. They look so unusual – even at car shows when surrounded by other rare vehicles. This car features a mid-mounted, 78 horsepower 1.7-liter V-4 from a Ford Taunus that drives the rear wheels. It is a targa, meaning the roof section is removable, leaving both front and rear glass in place. It does have room for four, though rear seat passengers better be small or very understanding. The 530LX was produced from 1970 to 1973, when the entire line was discontinued. It differed from earlier models in that it featured a slight re-design from Michelotti. This was the most popular 530 model built, with 4,731 units produced. This rare yellow bird should bring between $21,000-$26,000. Click here for more info and here for more from this sale. 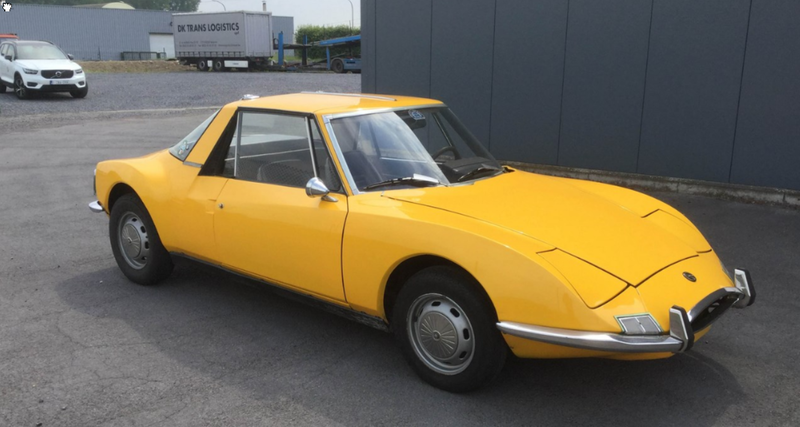 This entry was posted in Uncategorized and tagged 1972, 530lx, auctions, cars, classic cars, matra, osenat by classiccarweekly. Bookmark the permalink.